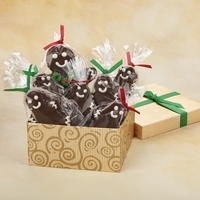 Our gingerbread people are scrumptious brownies dipped in fine chocolate and dressed up for the holiday season! Each set comes with a large gingerbread nanny watching over her brood of little people! Choose from 6, 12, 24 or 36 young’uns. This makes the perfect gift because it ensures that everyone will receive an individually wrapped treat!